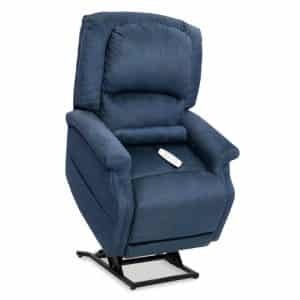 By purchasing the seat lift chair Pride LC 515IL, you’ll be choosing true infinite positioning that provides the most comfort at any given opportunity. Made in the USA by Pride Mobility, one of the leading brands in its field, the LC 515IL is an infinite lift chair built to provide the ultimate relaxing experience along with firm support due to an overstuffed head, lumbar pillow and lumbar roll pillow. Offering Zero Gravity and Trendelenburg positioning, this chair comes standard with a footrest extension made to hold up to 375 lbs and adjust to those in the 5’4 to 6’ range. Bring luxury and style to your home by choosing what best fits your decor from three different fabric selections, and rest assured that this purchase will last a lifetime due to the premium materials it’s built with. The seat lift chair Pride LC 515IL stands out for its luxurious design amongst all of the infinite position lift chairs in the market. Premium fabrics and materials make it an elegant addition to your home, while its seating area features individual pocketed coils meant to contour your body and provide maximum support and comfort. Its premium furniture grade laminate/hardwood frames provide added strength and durability meant to last a lifetime, coming with a 7 year warranty on parts, while its integrated battery backup serves in case of power outages. Enjoy great room for storage thanks to its two large standard pockets where you can fit anything you want, from your favorite book to the chair’s industry-first hand controls with USB charger port. At Orthopedic Service Company, we proudly work alongside the best brands in the market in order to provide our customers with the ultimate comfort and seating experience. Contact us today and we’ll answer all of your doubts and thoughts regarding this product, or visit our showroom to test it for yourself!